Global Milk Fat Fractions Market size is estimated to exceed USD 14 billion by 2024; according to a new research report by Global Market Insights, Inc. Potential applications in chocolate fillings, cream fillings, cakes, pastries, butter cookies, desserts, ice cream and confectionery products will propel the milk fat fractions market size. Optimization for specific application due to its defined melting points are key properties stimulating the product penetration. In addition, enhanced flavor, creamy & crusty textures along with easy spread-ability will provide a positive outlook for industry growth. Medium melting fractionated milk fat market is expected to value more than USD 6 billion by 2024. Strong outlook in bakery applications mainly including pastries and butter cookies due to its crusty & flaky texture will propel the product demand. Significant properties including wide range melting points from 15 0C to 30 0C along with technological advancement in crystallization process has enhanced the product scope. Expensive processing costs along with increasing raw material costs are major factors influencing product price trend. Lack of product awareness along with availability of low cost substitutes are among key factors restraining the industry growth. Dry fractionation/ melt crystallization dominated the industry share due to its higher adoption on commercial scale. Efficient crystallization, simple production process supported by cost-efficient properties will support the technology demand. Increasing R&D investments and innovations in production process are among major factors driving the industry growth. Liquid formulations will witness growth over 5.5% up to 2024. Increasing consumer preference for olein butter products due to its key health benefits including cholesterol reduction will drive the fractionated milk fat market growth. Availability of broad range products including olein, super olein and top olein variations will provide positive outlook for product demand. 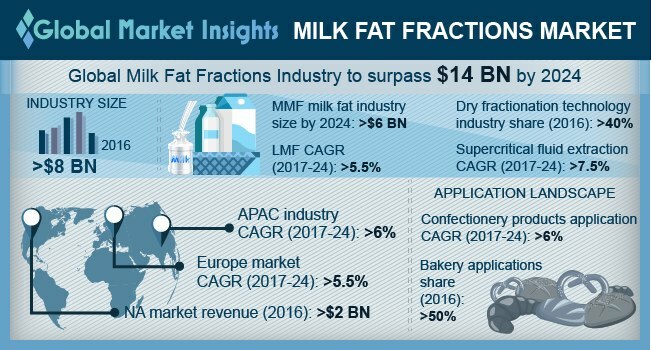 Milk fat fractions market was led by bakery applications accounting for more than 50% of the industry share in 2016. Increasing consumption of bakery products due to changing lifestyles particularly among millennials will propel the industry demand. Shifting trend towards healthy food habits along with innovations in bakery & confectionery products will support product penetration. Uelzena Ingredients, Royal VIV Buisman, Glanbia Ingredients and Friesland Campina are among major fractionated milk fat manufacturers. New product launches, production capacity expansion, collaborations and R&D investments are major strategies adopted by industry participants. Other considerable companies include FIT Company, Flechard S.A., Fonterra Cooperative Group, MCT Dairies and Wilmar International.